Heads up everyone. It looks more and more like we will see a chance for severe storms later this week. A storm is moving in to the southwest United States today. This storm will move east across the country. Once it reaches the Plains, ingredients will come together to spark storms in Kansas, Oklahoma, and Texas. By Friday, the storm will have moved east enough to start to get some activity around southeast Missouri, southern Illinois, western Kentucky, northwest Tennessee and northeast Arkansas. Here is the Day 3 Outlook from the Storm Prediction Center. The outlook covers the time period from 7am CT Friday - 7am CT Saturday. A warm front should begin to lift north across the area Friday afternoon. Thunderstorms will pop along the front. That is my biggest concern around the region Friday. Eventually the front should move up to north of St. Louis. Along the warm front the main threat will be large hail and possibly a few tornadoes. Further west, more organized lines of storms will develop and move east. Some of these storms could impact the KFVS viewing area late Friday night through early Saturday morning. SPC has included parts of the region in their Day 4 "heads up". (They don't start putting out Outlook products until day 3.) This covers 7am CT Saturday - 7am CT Sunday. All three main severe weather types (damaging wind, hail, and tornado) is possible at this point. We will start to get a better feeling towards what types will be more likely as we get closer to Friday. Here is a look at BUFKIT data specifically for the Cape Girardeau, Missouri area. 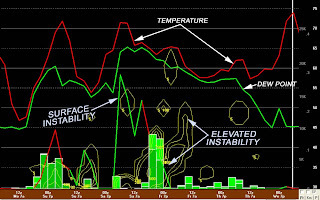 The last month or two I have been concerned with a lack of moisture in the low levels of the atmosphere to sustain severe storms around the area. This won't be the case for Friday and Saturday. You can see that the above model (0z Wednesday GFS) is bringing moisture (dew points) well in to the 60°'s. That is plenty of moisture to sustain severe storms this time of the year. Also note how the model spikes the surface instability Saturday afternoon. Right now I think we could see three rounds of potential severe weather. Friday afternoon as the warm front is lifting north across the area. There could also be isolated storms "bubbling up" in the afternoon south of the warm front in the warm sector. Overnight Friday in to Saturday when a line of storms could track over the KFVS viewing area. This line will be the line that initiates over eastern Oklahoma/western Missouri. The storms should weaken somewhat, but there will be a lot of upper level support to keep the storms going even with the loss of daytime heating. Late Saturday morning/early afternoon storms could initiate over the southern half of the KFVS viewing area and then move east. The models have been picking up on this system for a while. I first mentioned it on-air Saturday evening on Heartland News at 6pm. When the models stay this consistent with a storm system for this long, they are usually on to something. It has been a quiet severe weather season across the country and it is past time for things to pick-up. Maybe this will be the beginning of a more active pattern. If you haven't gone out to pick up a StormTeam Weather Radio today and/or tomorrow would be a good time to do so. They are still available at Orscheln stores in southeast Missouri, southern Illinois, and western Kentucky for a discounted price of $29.99. Be sure to follow @kfvsweather on Twitter for this event. We have just started a new service with the account. Watches/warnings will automatically be sent out via our Twitter account for the counties KFVS warns. We haven't "officially" launched the service so you are getting a little bit of "insider knowledge", but we are soft launching the addititional data today. We will also be sending out the information to special Facebook account. I am sure you will be hearing more about it in the coming weeks if we are satisfied with the way it performs.